The summer doldrums have all but taken over trade in equities. Trading volume has been light and so has the action. In fact, the S&P settled at nearly the same price for the month of June as it did a month earlier to close out May's trade. However, we can't help but feels as though the quiet range trade will have to give way to more volatility. The CBOE's volatility index known simply as the VIX, settled at 27.95 on Thursday but has reached levels slightly below 25. Based on historical standards, this is still relatively high, in 2007 the so called "fear index" was comfortable in the high teens. However, we have come from a reading of nearly 90 and the green shoots of recovery don't seem to be in full bloom. There may be a bit more market turmoil ahead. With that said, we don't expect a complete meltdown. While the fundamental picture isn't bright, it isn't as dire as it seemed during the September/October plunge. Also, with the exception of the NASDAQ, July has historically been the best performing month of the third quarter for the market. In addition, many believe that the beginning of the second half of the year sees a larger than normal inflow of retirement funds. Accordingly, the market has a tendency to begin the month of July strong, sag in the middle, then finish with a rally. The NASDAQ, on the other hand, has had a less than stellar history in the month of July. The tech sector index begins its "worst four months" of the year this month according to sources. Last month we correctly called the exhaustion rally in the S&P to 950 and the subsequent correction. This time we are looking for the opposite to occur. Given Thursday's swift selling ahead of the holiday weekend, we feel as though some temporary buying will come in at or near current levels. For instance, strong support lies in the S&P near 882 and 1420 in the NASDAQ. However, aside from what we feel could be a temporary rally we believe that the indices will make their way lower. Near the mid 850's or perhaps as low as 830 in the S&P but much lower in the NASDAQ. 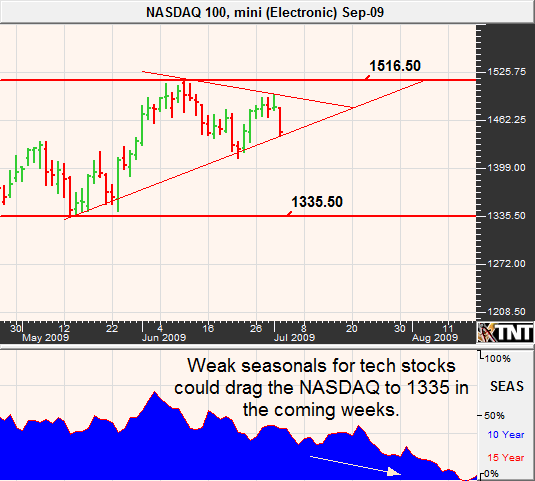 We think that the NASDAQ could see 1330 at some point this summer. As we had suspected in the last edition of this newsletter, the Treasury bears had simply gone too far. Oversold technical conditions, combined with an overly bearish market sentiment, finally sparked the short covering rally that we were looking for. Yes, the government is issuing bonds as if there are no limits or spending budget. Yes, China is becoming a bit uncomfortable with the stability of the dollar. Yes, the Fed's policy has the potential to cause great amounts of inflation at some point in the future. Nonetheless, each of these factors simply counteracts the sluggish economy and investors lack of appetite for risk. Also, just as the "baby-boomer" generation may have added to the weakness in equities by withdrawing retirement funds, they could be keeping a floor under bond prices as they are trying to protect what is left of their dream retirement. Additionally, just because the public has downgraded the Fed doesn't mean that the S&P will. As long as the AAA rating remains intact, foreign investors will likely look to the U.S. to park unused funds. After all, they don't have many "safer" alternatives. It doesn't seem as though Treasuries will see the large fallout that many are anticipating, nor double digit interest rates in longer dated instruments that were seen in the 1970's, as some aggressive analysts have predicted. In fact, we believe that the overall trend will remain higher in bonds and notes in the next several weeks but the real buying will likely come in the fall. 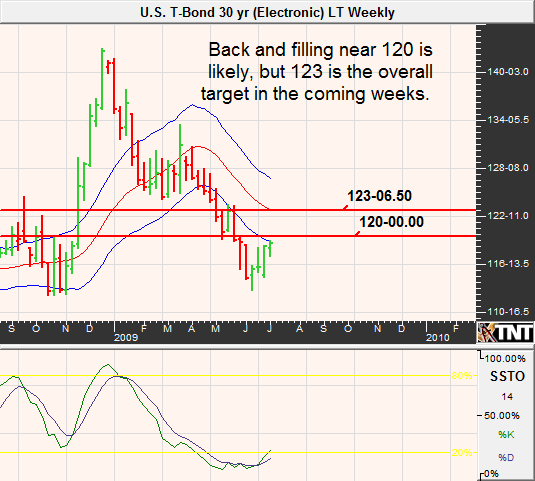 Last month we mentioned targets of 123'30 in the long bond and about 121 in the 10-year note. We have since revised our initial expectations to just over 123 and near 120 respectively. A pullback to 116ish in the 30-year bond may be supportive, while the note correction may find a floor near 115. Bond Bulletin followers, and clients, were recommended to sell the August bond 124 calls for 20 ticks, we hope to buy this back near 5 sometime early next week. We also recommended a synthetic put in the 5-year note (selling the futures and buying a call for insurance). In this market we are expecting a temporary correction. As summer progresses, grain prices become more reliant on seasonal tendencies combined with weather as opposed to stock and currency valuations. Aside from the occasional drought or flood, soybeans and corn typically spend the late spring and summer months in a relentless downtrend. So far this year has confirmed to historical standards. With that said, it is important to keep tabs on the greenback. Overall, we are looking for sideways to higher action in the U.S. dollar, which will help to keep a cap on any attempt at a grain rally. Likewise, we feel like equities may head a little lower before the rally can resume. This may have the opposite effect on grains. Also working against corn prices is the realization that inflation, although may be an issue in the future, is far from reality in the current. This was highlighted in the most recent CPI and PPI readings which suggested that inflation is relatively flat. Additionally, recent economic data suggests that the green shoots aren't so green...maybe yellow, and could still become brown. All things considered, it seems as though the path of least resistance will be lower in the complex in the coming months. On June 30th, the USDA announced that 87.04 million acres of corn were planted. This is up 1% from a year ago and is the second largest crop planted since 1946. The market was clearly surprised by the news as corn futures traded limited down following the report. 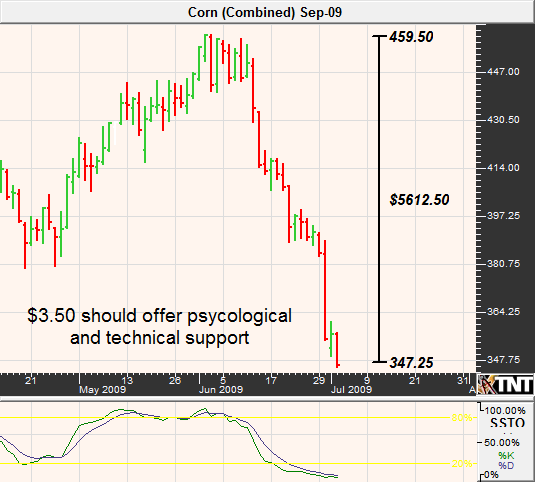 This, along with a stable but very slowly recovering economy, leaves corn prices oversold but vulnerable nonetheless. While there are many fundamental aspects of corn that seem bleak, we do not predict sharply lower prices in this market. It seems as though a majority of the damage to pricing has already taken hold. Supporting prices may be the fact that demand for corn remains strong in terms of exports and U.S. ending stocks are projected to drop to levels not seen in 40 years by the end of 2009/2010. Of course, the recently planted bumper crop impacts this projection in the other direction. These seasonal tendencies, combined with our assumption of a higher dollar and lower equities (yes we realize that we are boldly going against the grain), suggests that aside from a moderate continuation of the currently rally, and barring any unforeseen weather disaster, corn prices should trade consistently lower heading into July. 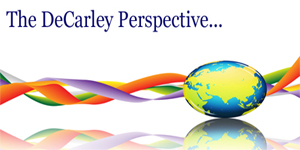 In last month's newsletter we noted that we liked being bearish above the $4.30 area. We have since re-adjusted our bearish level to $4.42 with the possibility of a spike high to $4.57 but prefer the short side from such levels. If we are wrong about the U.S. dollar and equities, corn could see prices above $5. Therefore, bears should be cautious. We have since witnessed one of the largest drops in the price of corn in history. However, things aren't as clear cut this time around. We feel as though oversold conditions should trigger a short covering rally but believe that the buying will be temporary. It seems as though this market could see a steady grind lower as we head into late August. Look for prices to find support near $3.50, at which time a bounce could occur. Don't be surprised to see prices poke above $4.00 on the September contract before resuming the slide. 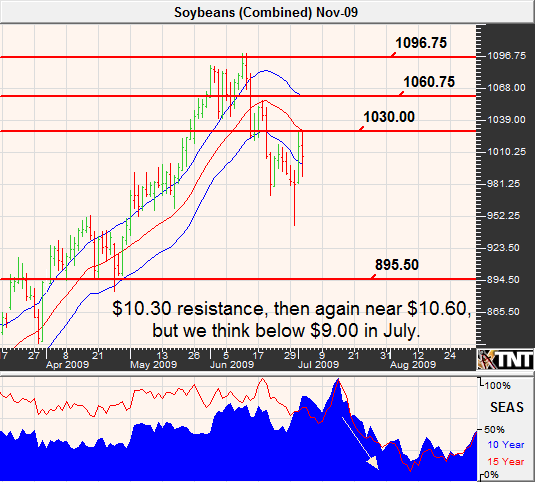 Soybeans continue to display stronger market fundamentals than corn, and this is evidenced in the prices of each. While corn has been in a relative freefall since the first week of June, Soybeans have managed to keep slightly more composure. Unlike corn, the soybean planted acreage numbers, although impressive, were less than expected. According to the USDA there were 77.48 million acres of soybeans planted; this is up 2% from a year ago and sets a new record high. The market's initial reaction was to follow corn lower, but at the end of the session soybean prices had pared losses and set the market up for a rebound. The lack of follow through in beans may have had something to do with the June 10th realization that the ending stocks estimates by the USDA were being revised lower to 210 million bushels from 230. Also, according to the USDA, "Brazil's soybean oil exports are expected to decline sharply as the government announced a further increase in biodiesel admixtures." This month we feel as though the upside may be limited in the absence of a weather scare. It seems as though the $10.30 in November beans has a good chance of holding resistance, but believe that should prices reach $10.60 it could be a great opportunity for the bears. Crude oil seasonals in July tend to be relatively supportive, particularly in the first half of the month. In fact, July has historically been the best month to get long natural gas. According to the Commodity Traders' Almanac, buying natural gas "on or about" July 24th and holding until October 21 has been successful 17 of the last 18 years. Keep in mind, with statistics and claims such as this it is difficult to determine how large the draw downs may have been during such years before becoming a successful venture. Also, it is important to note that dire fundamentals in natural gas have forced many rigs out of operation. In effect, there are currently about half as many as were in operation near the 2008 peak. Eventually, this phenomenon will impact the oversupply picture and force prices higher. Despite seasonal support, it seems as though technical factors and the possibility of a stable to higher dollar could work moderately against crude prices in the near term. 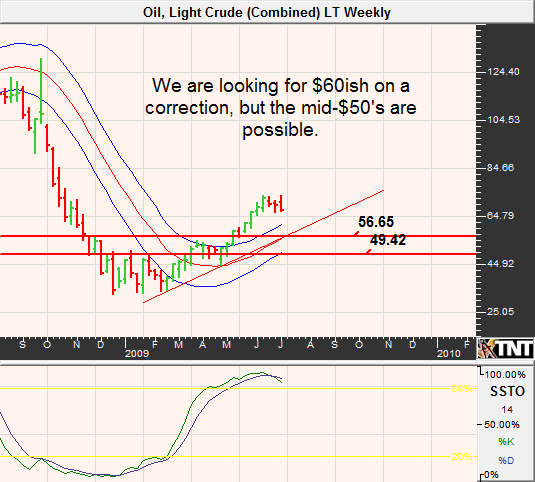 Last month we mentioned, " We can't help but feeling bearish on crude once the July futures reach the high $60's but we do respect the possibility of a move to the low $70's." This month we are similarly leaning lower. We see strong support near the $65/$66 area and feel that a temporary bounce could be in the works. However, we wouldn't expect a technical bounce to trade above $71 and are ultimately looking for prices to trade closer to $60 at some point this month. After all, the U.S. Energy Department reported that surplus capacity was up to 4.3 million barrels per day, up from 1.5 in 2008. Stabilization in the Dollar, and signs of so called green shoots in the economy, have quickly turned gold and silver out of favor. If ever there was a market that was "trendy", this is it; it seems like being bullish and bearish the metals goes in and out of style quicker than the latest clothing trends. However, as a trader it is important to realize that it is sometimes a great market to be a contrarian in. In our last newsletter, we boldly went against the grain by calling a near-term top in both gold and silver. As it turns out, it was a daring but accurate call. This month, we are not nearly as courageous. Technicals and fundamentals seem mixed and we are having a difficult time picking either side of the market. 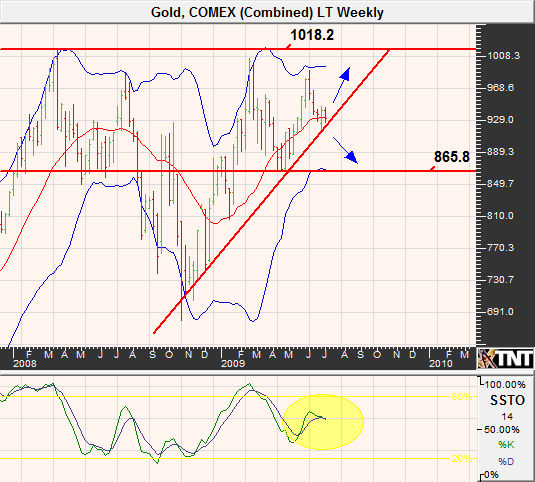 What we can say, is that it seems probable that gold will make a large move in one direction or the other from here. Despite our lack of conviction in a direction, the Commodity Trader's Alamac notes a seasonal trade that begins in late July. According to the source, 78.8% of the time over the last 33 years a long position initiated "on or about" July 27th and held until September has been successful. With this in mind, it may make sense to become bullish gold in late July should the August contract be trading in the mid to low $860's. 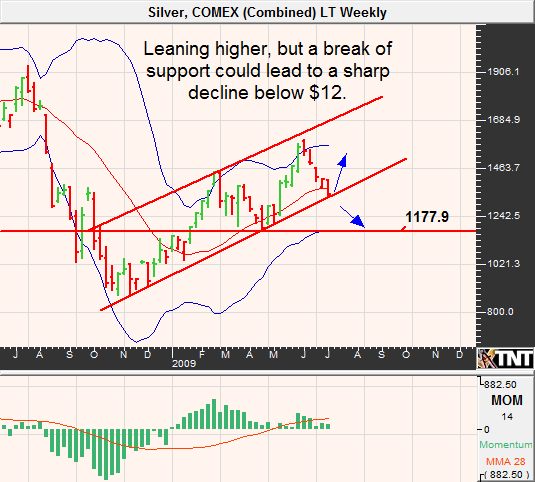 Silver prices have a more supportive technical environment, but could follow gold lower in the near term. We like the idea of being slightly bullish silver, but a break of trendline support could mean disaster for this market. Therefore, extra caution is warranted. 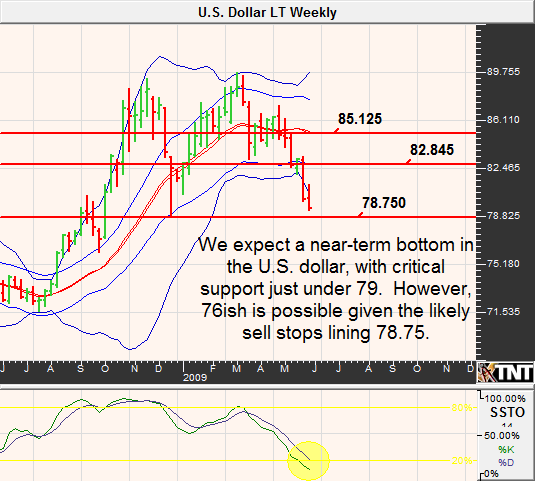 The September Dollar index has been stuck in a trading range between 79.60 and 82.00 since our last newsletter. We were right about the Dollar finding a bottom but were wrong in terms of how far the rally from the lows would extend. We had much higher hopes for the greenback. Currency traders are still wrestling with a "which is worse" scenario. It is hard to be bullish the Dollar when the economic fundamentals are sluggish; however, it is difficult to determine a currency that is backed by a superior situation. Last month we recommending being bullish just below 79, and that would have worked very well. This month we still prefer the long side of the market, but believe that the bulls are best off waiting for an opportunity just below 78.00 on the September contract. We have come to this conclusion with the assumption that light volume and the recent low market volatility could lead to stop running below support levels before reversing higher. The great aspect about trading the Dollar index is the low margin requirement and the ability to purchase cheap options to protect futures positions. Traders that look to go long the Dollar index at noted level may also want to price out reasonable insurance policies (put options). Rumor has it that the recent, and sudden, rally in sugar futures was primarily the doing of a "reinflation" play by major money managers and trend-following funds. Nonetheless, the realization that the commodity rally may have gotten ahead of the actual economic recovery could trigger second thoughts. According to our sources, the open interest in mid-June was nearly six times that of the end of April. This tells us that there could be some necessary long liquidation ahead. The market appears to be "too long" and speculative traders can be fickle. Additionally, our softs broker on the ICE floor mentioned to me late last week that he didn't see any real reason why sugar should advance from here; he expects consolidation trade. In our previous newsletter, we mentioned bullish seasonal tendencies and noted that a "continuation of the rally could materialize in late June". We still feel like seasonals are pointing higher, but are looking for a correction of the recent run up. We begin to be bulls beneath 17 cents. Despite what many were pointing out as strong market fundamentals, the seasonal tendency for coffee to lose value in the absence of a South American freeze dominated trade in June. Weak seasonalities tend to continue to take hold of this market until mid-August. Therefore we continue to lean lower overall. With that in mind, coffee prices have dropped sharply in a very short period of time. It is highly likely that we will see some sort of technical bounce. After all, the USDA reported that the estimated world coffee stocks will drop to historically low levels and Brazil's production is expected to be considerably lower than the previous year. Last month we saw heavy support in the July contract near 119, and we now know that our targets were too moderate. 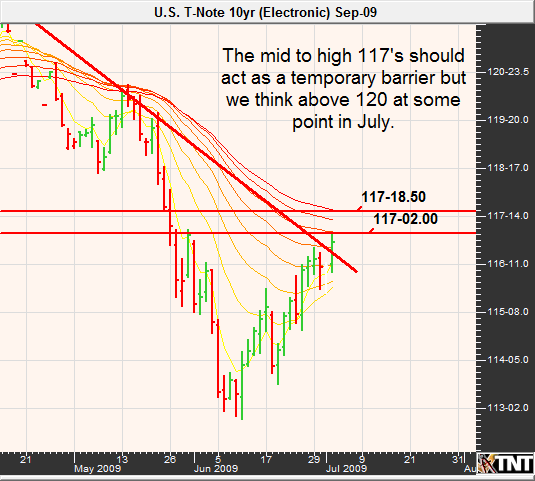 September coffee, currently trading near 118 seems to be on a path toward 112. However, it seems highly risky to be a bear before some type of short covering bounce. 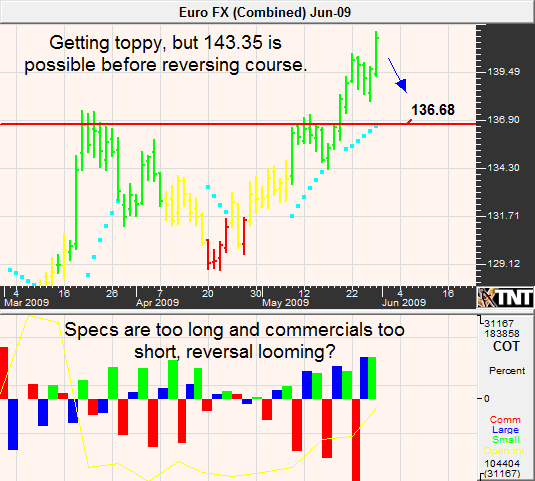 We think that it may be possible for the bears to get positions with the futures at or near 124. Domestic consumers are still steering clear of pork; likewise, there are still bans of pork exports to many countries. In addition, high grain prices are forcing ranchers to send their herds to slaughter much earlier than what may otherwise be. As a result, cash market supplies for pork is relatively high and as the market attempts to absorb the excess, prices continue to be under pressure. 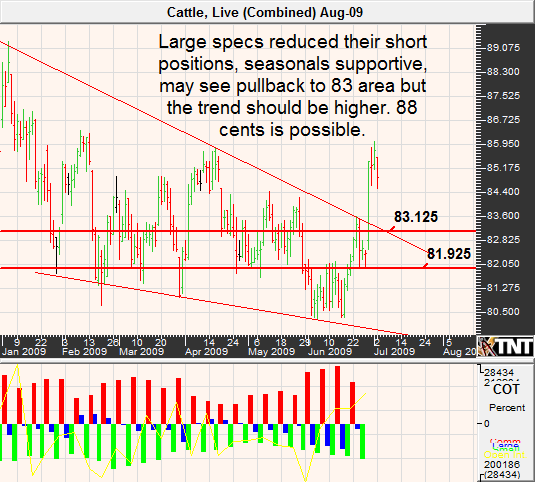 Last month we had been looking for hog prices to fill a gap left on the chart in the midst of the swine flu panic. We now know that we were wrong in assuming that prices could be influenced that much by technical factors in the middle of an economic recession in combination of higher grains prices. That said, with grain prices on the decline, ranchers may be prone to holding their inventory longer. This should have a positive impact on price behavior. Nonetheless, the seasonal picture for hogs look bleak. 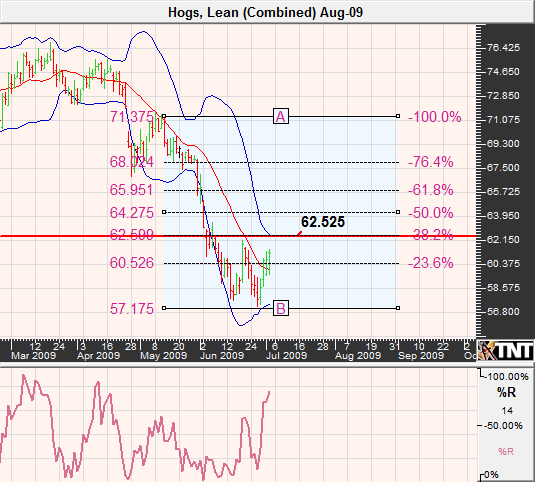 We predict that the August lean hog futures contract will continue to consolidate, and may reach prices at high the mid-64 cent range but will eventually make their way back under 50 cents. Cattle prices have also been plagued by low demand and high grain prices. Conversely, the U.S. cattle inventory is at its lowest level in 50 years. This alone, should be supportive but seasonal strength and the possibility of an economic recovery should also keep the bulls in control of this market for the next few months. From a technical standpoint, it seems as though there should be some digestion of the recent run up. 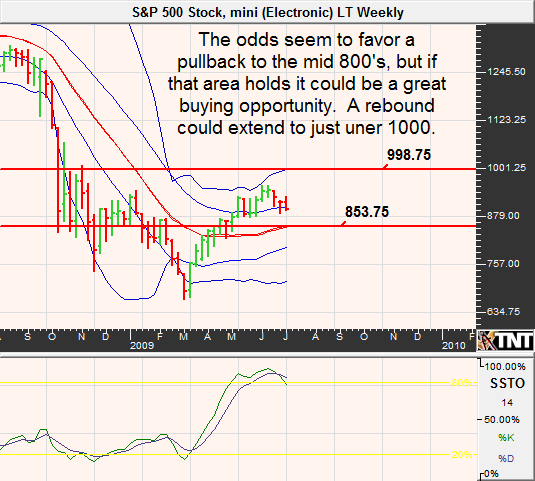 We believe that a pullback to the 83 area is likely before resuming the uptrend. The next key resistance area is 88.